Entrepreneur Ranks Squaremouth One of Best Companies in U.S. 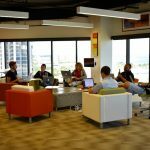 Entrepreneur Magazine Ranks St. Pete-based Squaremouth One of the Best Companies in the U.S.
ST. PETERSBURG FL December 21, 2017 — Entrepreneur Magazine named St. Petersburg-based insurance software company, Squaremouth, one of the 360 Best Entrepreneurial Companies in America for its multimillion dollar growth and Silicon Valley-like perks. Squaremouth is ranked the 175th most entrepreneurial company in the U.S., based on 4 key factors: Growth, Innovation, Leadership, and Impact. Squaremouth surpassed $21 million in annual sales in 2017, a 25% increase over the previous year. Despite its steady growth, Squaremouth has never set financial goals. Instead, CEO Chris Harvey focuses on engaging employees and exceeding customer expectations by maintaining an innovative company culture. Squaremouth’s most popular employee benefits – unlimited paid vacation and mandatory birthdays off with a $200 beer bonus – have been around since the company started. But the company continues to add perks, including a company boat and company-paid vacations. Inside their office space, the company encourages a collaborative and lively environment by stocking the open floor plan with arcade games, napping couches, and a beer fridge. Instead of assigned desks, employees are required to sit somewhere new each day. From the glass-walled offices to the company’s financials, Squaremouth has maintained complete transparency. Even employee salaries are shared with everyone throughout the company. When an employee wants a raise, they give a presentation to the entire company, who then cast a vote. Every employee, including the CEO, gets one, equal vote. The core value of Squaremouth’s award-winning customer service team is “downselling”, helping every customer save money by finding the best insurance policy for the lowest possible price. In fact, this sometimes means staff recommend not making a purchase at all. With no commission at stake, there is no incentive to push sales. This is Squaremouth’s first year on the Entrepreneur 360 list. The company has also been ranked one of the best workplaces in the country in 2017 by Fortune and Inc. magazines, and has been an Inc. 5000 fastest-growing company for the past five years.